"Paint from your heart; don't just go along with the latest fad. Your art will last longer then." David K. John has lived his own words, working from his own inspiration, creating paintings based on Navajo mythology and stories. Communicating a quiet spirituality that speaks universally his unique expressions are becoming more widely recognized and admired. Raised by his great grandfather, a medicine man, John grew up in Keams Canyon, Arizona. He spent hours every day listening to the stories and teachings of his homeland. After his grandfather passed away, John began his formal education and attended the Institute of American Indian Arts in Santa Fe New Mexico; Brigham Young University in Provo, Utah; and graduated with a B. S. Degree in Arts from Southern Utah University in Cedar City, Utah. John returned home to Keams Canyon and began expressing his interpretations of childhood teachings with the utmost care and respect in his paintings. "I must be careful with these symbols and the sacred information I draw inspiration from. My paintings are my own vision. I believe it is the role of the artist to communicate and teach the next generation." 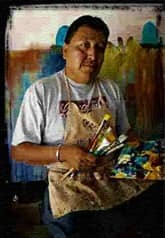 John has won many awards for his paintings and masks at the Eight Northern Pueblos Art Shows, Intertribal Ceremonial in Gallup, Museum of Northern Arizona Navajo Shows and the Santa Fe Indian Market, among others.